I know I must be spoiled after 2 straight years with compelling Masters Tournament finishes, so after Bubba Watson holed his putt on the 72nd hole of the 2014 Masters Sunday afternoon, I felt I had been cheated. After all, 2 years ago Bubba made one of the best shots I had ever seen on the 10th hole to beat Louis Oosthuizen in a playoff. Yesterday, he couldn’t even make the birdie putt at 18 to put an exclamation point on his victory over rookies Jordan Spieth and Jonas Blixt. No matter how you and I look at it, he did win the Masters for a second time in 3 years, and it really wasn’t Bubba’s fault that no one else made a legitimate charge on the back nine. Missing from the hills around Augusta National this year were the cheers from afar when you knew Tiger, or Phil had done something special. Spieth came out with guns blazing on the front nine and caught Bubba with a left hook when he made birdies at 2, and 4 and then a pair at 6 and 7. But the eighth hole was where the tournament turned for Bubba Watson after the 20 year-old Spieth came away from the par 5 with a bogey. Bubba counter-punched the youngster with a great birdie at 9 and by the time Jordan collected his thoughts after he couldn’t get the par putt to fall, it was all over. Then the unthinkable happened in Amen Corner when the rookie misjudged the wind and put his tee shot in Rae’s Creek. There were 6 holes left that were in Bubba’s wheel-house, and he wasn’t going to make a veteran mistake to give away the 3-shot lead. He even 4-wood at 18, a hole he doesn’t like, and cruised into the clubhouse to pick up his second Green Jacket. I think Jordan Spieth got on cruise control after the success he found early in the round, and in his mind was being sized for a Green Jacket. He learned a hard lesson at Augusta on Sunday, but he had a front row seat to see how it should be done. He will be back, and he will be back with some knowledge he gained the first time around. For those of you who thought Bubba Watson was a one-hit-wonder, shame on you. He got busy after the last Masters victory in 2012 with life. And like he said in an earlier press conference, he was still celebrating the 2012 win until the 2014 season got started. Bubba has the power and knowledge to win at Augusta. I don’t think he is a candidate for a US or British Open, but he could play well at Ponte Vedre or a PGA Championship down the road. He does however, have the game to be a contender anytime they tee it up at Augusta National, and could be a factor there for at least the next ten years! Who Are The Best Players on TOUR Who Don’t Own A Major Title? With the 2014 Masters Tournament getting underway next week, which kicks off the major season, it’s never too early to start talking about who are the best players in the game who have yet to win a major championship. The list changes every year because you have to eliminate some players who are getting long in the tooth, and really are no threat to win the big one. The big name that was on the yearly list was Colin Montgomerie. But now that he has been put out to pasture on the Champions Tour, he may be a threat to win a senior major title, but for all practical purposes is done competing in the majors on the regular tour. The two big names that come to mind for the 2014 season who ready to contend, and win their first major in 2014 are Henrik Stenson, and Matt Kuchar. 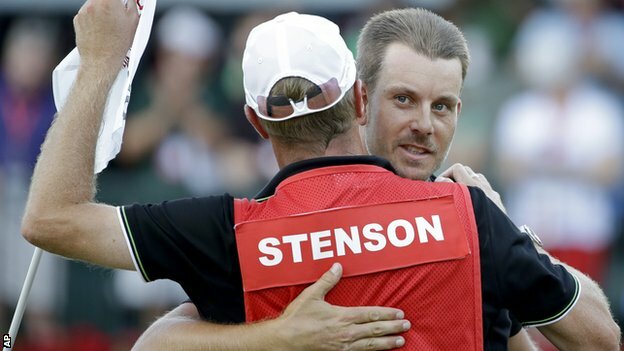 Stenson is a no-brainer after what he did in 2013 to be the best player in the world today without a major title. I have Kuch firmly tucked into second place on the list. Henrik Stenson looked out of sorts after returning from the off-season where his life had to be a whirl-wind of sponsor and talk show stops. He even said in an interview that he really didn’t have much time to practice, or rest after winning the FedExCup and the Race To Dubai. I’m sure his bank account is happy, but you have to know that winning a major is a goal he needs to satisfy pretty soon. At age 37, we have seen what age can do to a body, and a golf swing. Just ask Tiger Woods, or Phil Mickelson. I liked what I saw from the world’s number three player at Bay Hill. He had been struggling with his driver all spring, and seemed to be hitting the ball much better. He had a week off to bond with his putter, and we should see a much improved Henrik Stenson this week in Houston. He finished tied with Billy Horschel for second place here last year and a good finish would do a lot to boost his confidence as they head to Augusta next week. Matt Kuchar is also on the verge, and needs to take the next step this year. He won the THE PLAYERS Championship a couple of years ago, and certainly has the game to win a major this year. I don’t think he, or Stenson will win in Augusta, but I wouldn’t count either one of them out for the three remaining tournaments. I wouldn’t read too much into what Matt Kuchar did on Sunday at TPC San Antonio. He was paired with a human rain-delay, and the pressure from tournament officials to hurry took him out of his game. I really felt like he would make a Sunday run, and with his pedigree, maybe pull out a win, but it didn’t happen. Although Matt Kuchar and his driving accuracy numbers won’t have an advantage at Augusta (there’s no rough there). it will come into play at Pinehurst. With that being said, I think Matt’s best chance this year will come later. If I was forced to make this a list of five, I would have to include, Lee Westwood, Steve Stricker, and probably Dustin Johnson. I feel like Westwood and Stricker have missed the boat at this point, and Dustin has missed the opportunities. Dustin Johnson has the game, and youth to still get some majors. His maturity and short game have improved, and all he needs to do now is get himself in contention. Lee Westwood on the other hand is probably done looking for that first major. It was a valiant effort to move his family to Florida so he could practice more, but I think it’s too little too late at this point. Unfortunately, like a lot of other players from his time, he was derailed by the lack of a short game, and Tiger Woods! Author Les BaileyPosted on 04/01/2014 Categories UncategorizedLeave a comment on Who Are The Best Players on TOUR Who Don’t Own A Major Title? This is without a doubt, one of my favorite sports images in golf history. If you are a golf fan, this image is almost as definitive as the day President Kennedy was assassinated in Dallas. An aging Payne Stewart consoling a young Phil Mickelson after sinking a 15 foot par putt and snatching the first of six US Opens away from the youngster. If I remember, Payne told Phil in this moment, there will be more chances for you in the future. It would be Payne’s final moment for glory. Little did we know that at the top of his game, this would be Payne Srewat’s final US Open win, and his final tournament. Stewart was killed in a plane crash five months later, and this would be the last of his 11 PGA Tour wins. Although Phil Mickelson has went on to surpass Payne Stewarts 11 PGA TOUR wins, and his three major championships, he still hasn’t been able to surpass this moment. He’s been close five more times, but has never held the trophy in his hand. This year, the US Open returns to Pinehurst Number Two, and maybe Phil Mickelson can end the curse where it started. He will have to contend with Tiger Woods, Henrik Stenson, and a host of great tour players if he wants to get back to the moment depicted above. One thing is certain, Payne Stewart will not stop him this time. The 1999 US Open at Pinehurst was a typical layout. Payne Stewart was the only player in the field that was under par, and Phil finished in second place at even par. After finishing the second round in a tie for the lead with Phil, and David Duval, Stewart was able to get a one stroke lead to carry into the weekend. After Stewart made a bogey at the 12th hole on Sunday, Phil actually had a one-shot lead. He followed with birdie at 13 to get the score tied until he made yet another bogey at 15. Then Phil bogeyed the 16th hole, and when Stewart birdied 17, Phil’s fate was in the hands of Payne Stewart at 18. And we still talk about the 15 foot putt Stewart made to win. Vijay Singh and Tiger Woods had chances down the stretch, but ended their day tied for third place at one over par. Payne Stewart had led the 1998 US Open at the Olympic Club for three rounds, but lost a five shot lead to Lee Janzen to finish in second place. It only took Stewart one year to avenge his loss at the Olympic Club. It’s been 15 years, but maybe 2014 is the year Phil Mickelson can get this monkey off his back, and give us a different picture to remember him by. As the PGA TOUR moves into California this week for The Farmers Insurance Open, we should see the return of Tiger Woods. He will be joined at Torrey Pines by a well-traveled Phil Mickelson and a host of young talent that is poised to take them down. We saw Phil come back from deep in the pack at Abu Dhabi to almost pull out a win. Had it not been for rules violation by a resurgent Rory McIlroy, and a double-hit, right-handed debacle at the 13th hole on Sunday, we might well have gotten an epic battle down the stretch in the African desert. With Phil and Tiger both fielding new drivers, and both excited about their clubs, maybe we will get a battle Torrey Pines this week. Both players have had success on this course, and this week could provide one of those battles for the ages. We haven’t seen Tiger since he was beaten on a miracle shot by Zach Johnson back in December at the Northwestern Mutual. Even Tiger thought Zach’s par from the drop-zone was epic. After all, it was a Tiger moment, and the 14-time major winner wasn’t the star. Don’t worry Tiger, Zach is taking a couple of weeks off, and won’t be at Torrey Pines. Tiger won this event last year for the first of 5 victories on the year. With the weather playing a huge factor in most of the tournaments last year, at Torrey Pines, it was fog. Fog cancelled play on Saturday, and the event was forced into a Monday finish where Tiger won by four shots in an excruciating finish that saw 15-20 minutes between shots due to slow play. Torrey Pines is a 36 hole layout in La Jolla, California which plays along the Pacific Ocean, and has some of the most beautiful vistas on the PGA TOUR. The course was established in 1957 and both the North and South courses were designed by William F. Bell. The property was formerly the site of a World War II army base called Camp Callan. The South Course is the toughest of the 2 courses, and plays almost 6 stokes tougher that the North Course. It is the site of the Farmers Insurance Open, and was the site of the 2008 U.S. Open where Tiger limped his way around on a Monday playoff to beat Rocco Mediate. That was Tigers 14th, and last major championship. Torrey Pines South is a par 72 layout, 7606 yards, and plays to a 78.1 Course Rating. Torrey Pines is named after a tree that grows only along this stretch of coastline in California. The golf course is public, and you can play there. On weekends, individuals arrive as early as 6 PM the prior night to get in line for the first-come, first-served tee times that are given out from sunrise till the first reservations at 7:30 AM. In attempt to bring golf to China, the now 15 year-old Guan Tianlang has been thrust into a world where he is not ready to compete. The youngster from Guangzhou, China became famous last year after he won the Asia-Pacific Amateur Championship. The victory in Thailand came with an automatic invitation to the 2013 Masters Tournament. Guan became the youngest player in history to make the cut at the historical event, and he battled through a slow-play penalty which was lost in the debacle Tiger Woods had at the 15th hole on Friday. I think that many players on the tour suffer from slow-play, but the officials at the Masters elected to drop a penalty on a kid that not only was struggling to keep up, but struggling with a language barrier as well. The youngster managed a 58th place finish, and was provided a sponsors exemption to play at the Zurich Classic of New Orleans two weeks later. He managed to make the cut at three under par, but finished dead last. He followed more sponsor exemptions, and played at the HP Byron Nelson Championship, the Memorial Tournament, and the FedEx St. Jude Classic where he missed the cut in all three events. Tianalang turned 15 years-old back in October, and here he is again. With another exemption, he was invited to play at the Sony Open this week in Hawaii at the Waialae Country Club where he missed yet another cut. He shot eight over par in a tournament where the cut line was one under par, and finished near the bottom of the field. I believe Tianlang is being fast-tracked into professional golf, and more harm than good is being done here. China is quickly building golf courses and wants to be a player in this sport that generates mega-dollars. Guan Tianlang is neither ready, or able at this time to compete with the best in the world. They need to give this talented youngster time to develop his body, and mind before they force him into these situations where the only thing he is doing, is learning failure. Come on guys… Let this kid grow up!